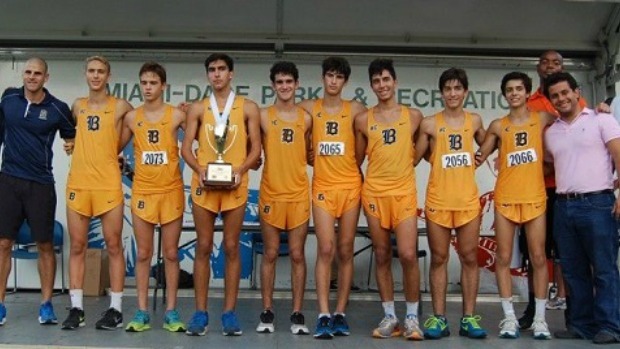 Belen Jesuit come in at number one on our top ten teams regardless of class. The Wolverines have proven why they are a powerhouse program (seven state titles in eight years) year in and year out winning their first four meets of the season with relative ease. They took home the team trophy at the Estero DDD Invitational, Pine Crest Cross Country Invitational, Miami-Dade County Youth Fair, and recently at the UF Mt. Dew Invitational where the squad posted a 16:15 team average on a quick Mark Bostick Golf Course in Gainesville. Senior Ryan Rodriguez is the team's number one runner and the leader of a squad that relies on a bevy of juniors. See where your team ranks on the list! Note: This list is based on 2014 season best times.